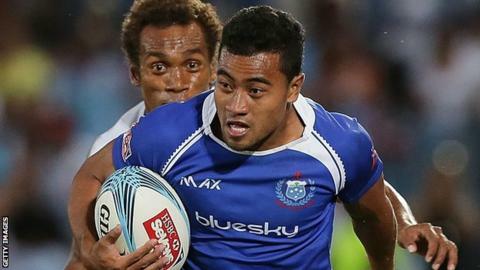 Jersey have signed Samoa international centre Fautua Otto and former Scotland Under-20 forward Gary Graham. Otto, 29, and has committed himself to St Peter until the summer of 2016. Graham, 22, who can play anywhere in the back five, most recently played for Gala in the Scottish Premiership. He is the son of former Scotland international prop George Graham and represented his country at the 2012 Junior World Cup. "Tua is a proven performer at this level who also has international experience," head coach Harvey Biljon said of Otto, who has played sevens for his country as well as winning 12 full caps. "I expect him to bring a real cutting edge to our game, and to cause some trouble for opposition defences. "Gary is a player who was on our radar as a potential signing for this summer, but we were able to agree that he would join us now for the rest of this season. "He's a player with great potential and I'm hoping he will make an immediate impact as he steps up to a fully professional environment."